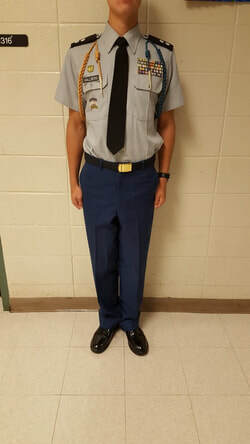 ​Class B (male)- Grey collared shirt sleeved shirt, army blue pants, black necktie, black oxford shoes, black dress socks, belt with brass buckle, and uniform accessories on the grey shirt (ribbons, torches, name plate, arc pins, cords, etc..) Check the JROTC manual for specific placement. ​Wind Suit- Green JROTC wind suit with white PT shirt underneath and athletic shoes. student can use it throughout their JROTC career.